Since equity markets have appreciated considerably since year 2008, the opportunities of quick and high profits have shrunk. Investors will have to be very selective, more patient and also tone down their return expectations in 2013. However, I will be more focusing on generating fast return from stock trading next year. My current stock investment account balance is RM25,000-RM30,000. I will top up an additional fund of RM10,000 in my stock portfolio on January onwards and it will be revised on 1st July 2012. This is for me to go through stock performance screening process to ensure that I won’t commit all my funds allocated for poorly performed equity. My net profit target next year will be 30% ROI (Return on Investment) with approximately 2.5% profit each month. I believe that it’s achievable if using the dFormula 3.0 – improved investment strategies and techniques which have been tested successfully. When it comes to career advancement, our competency level and self-dedications are very important. For me, I will always try to gain as much as experience that I could to take it to the next level. Therefore, finding a challenging job which offering more room to grow and supports my work will help me in making a positive career move. Besides that, we should always harness our courage to step out of comfort zone. By doing this, you must not be afraid to fail. For example, if you’re starting to feel not challenging in your current position, you may be ready to look for career advancement. This is to ensure that you can take control of your future and progress down the right career path wisely. 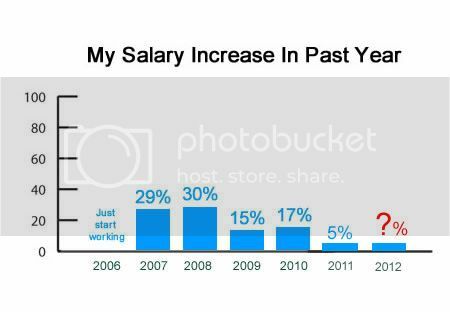 What’s Your Expected Salary Increment for Year 2012? Just wondering, what’s your annual increment like? Normally, the increment can range between 5-20% which depends very much on individual performance, size, nature, and culture of the company. However, for those skilled employees, the wages are still linked to experience, productivity and demand. Most of the organisations are still willing to offer attractive remuneration packages for candidates equipped with the desired skills. Thus, highly skilled and productive employees are more likely to earn more.